Lucy has an emergency. She needs cookie recipes "that make people pull you aside and beg (for the recipe). I want this experience burned in their minds!" I thought I would share with everyone. Even though there are three steps, it always seems easy to make. I think the secret of its yumminess is that the lemon glaze is unexpected and cuts the richness of the filling. Cut 1/2 cup butter into 1/2 cup brown sugar and 1-1/2 cups flour. Pat down into buttered 9x13 pan. Bake 10 minutes at 275 degrees. Beat eggs. Add rest of the ingredients and pour over warm crust. Bake 20 minutes at 350 degrees. While warm, spread with glaze: 1 cup confectioner's sugar, 1 T. melted butter and juice and zest of one lemon. Fall foliage and spring bloom. Spotting this prompted me to take out my camera and shoot some fall pictures from my garden. 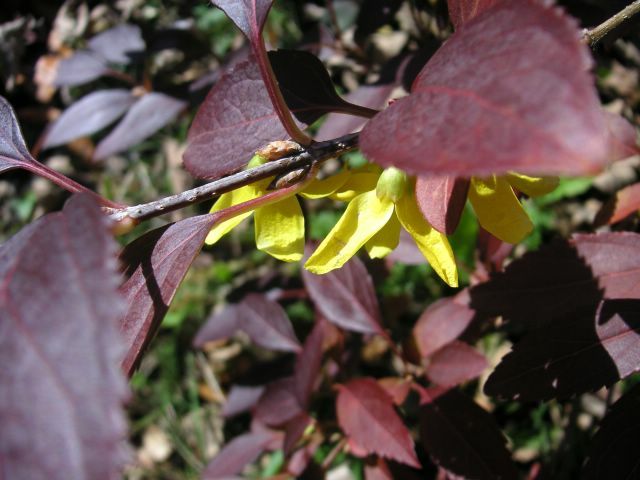 Update: This is a forsythia, deciding to flower in the fall. 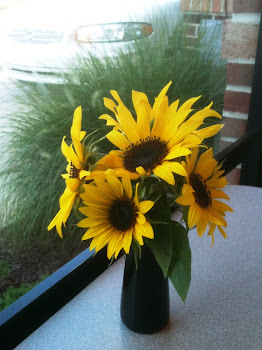 Unexpected beauty and surprises are bonuses to all gardeners. I added a herb garden next to the back deck by burying, at different depths, some large clay drainpipes from the farm. The boys dug the holes and placed the pipes last spring in pouring rain, a memory-making event. 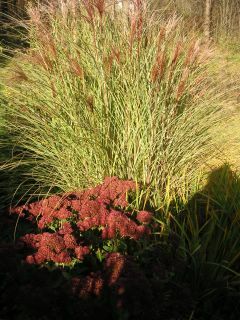 Sedum and grass. I like the way the sedum pulls out the red in the grass and its a nice combination of succulent rigid foliage and swaying grass even when it isn't blooming. Part of my front yard and part of my finger. I love the colors in my garden this time of year. 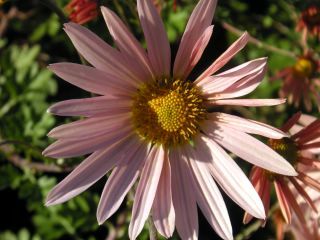 A close-up of the mum, which I only had time to trim back once this spring) follows. This is one of my favorite mums, because it looks so unmumlike (the way I look?) They were covered with pollinators, still trying to produce even after killing frost and snow. The last rudbeckia, still glowing by my garden path. I've been busy getting both the state's and my garden ready for winter. I have been very energetic these past few weeks, a function of lower temps and the amount of work I need to do. 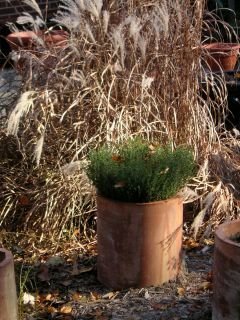 Seeds have been collected for sale in the spring, tender annuals have been potted and stored in the farmhouse bay window, and tender bulbs (tubers, rhizomes and corms too) have been dug, dried and stored. 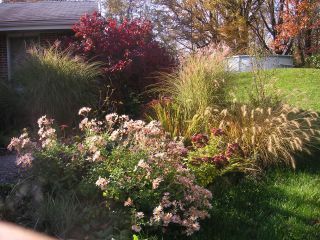 I still need to weed, rake and mulch leaves for bed covers and plant spring bulbs. I took some photos of my garden yesterday. Blogger refused to publish them last night and this morning. I'll post them using Hello. 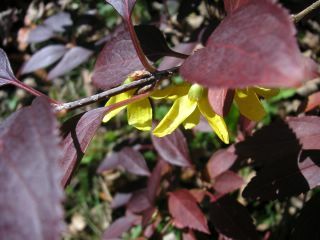 Fall foliage and spring blooms. Studies in red. A daisy-like mum. 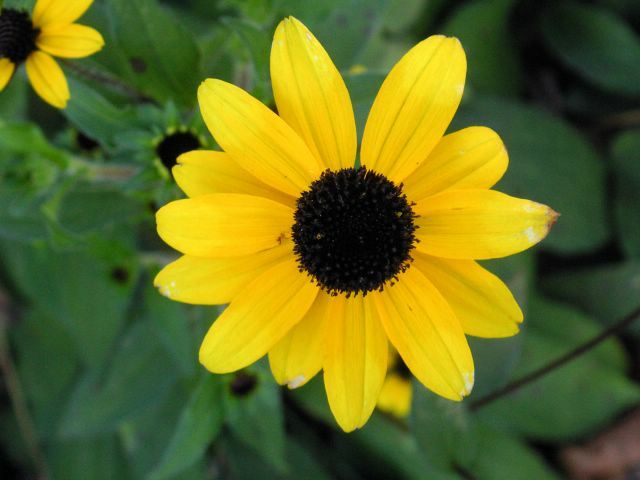 The long-lasting rudbeckia. Soccer Sectionals were postponed from Thursday night until today (in an hour so I have to post and run). If you like to garden and if you like to read, check out the garden bookclub being organized over at May Dreams Gardens. The first book should be selected soon. Saturday night, Ricky invited the soccer team (and dates) to a bonfire to fire-up for Sectionals. It was a good bunch of kids and everyone had fun. It rained heavy all day but stopped half an hour before the party just as we were moving everything inside. There was a half moon and a sky full of stars. Steve saw a shooting star and I told him to make a wish. He looked at me intensely and said, "I can't make a wish because I have all that a man could wish for." The boys groaned and muttered, "smooth," but I saw the look of pleasure in their eyes, the pleasure of hearing a man honor his wife. They wanted Steve to play his dulcimer, but he was at the bottom of the hill. So I called him with our signal...I call him with an owl's call and he calls me with the bob-white call. So much nicer than yelling someone's name. My hoo-hooting startled the kids, but I had to giggle at Ricky's explanation, "Oh, that's Mom's mating call." We mowed the wildflower meadow for the party. The asters were in full bloom and the butterfly weed pods were still green. I hope it doesn't harm the reseeding. Ricky's soccer team tied for first place in their conference. Now on to the sectional games, starting Thursday against Bishop Dwenger. 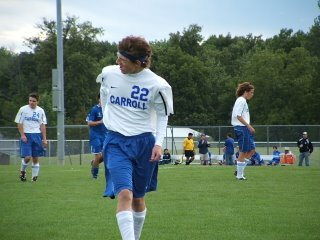 I discovered I love soccer, and not just because I have a son playing. I'm not much for spectator sports; there are too many other things I enjoy doing. But soccer is different. It's fast, it's furious, it's strategic and often a thing of beauty.